We are proud to announce the inaugural Bender Jamboree in the entertainment capital of the world, Las Vegas! 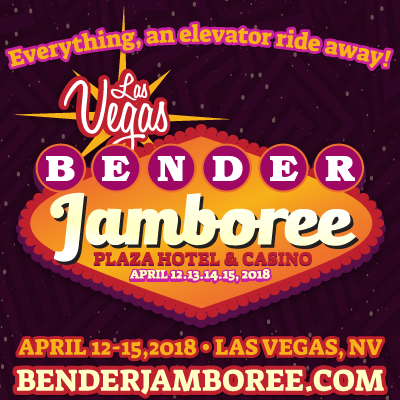 Located in the heart of the original downtown Las Vegas, The Bender Jamboree will take over the Plaza Hotel & Casino on April 12.13.14.15, 2018. Guests will enjoy the best in progressive acoustic and Americana music, just steps away from their hotel rooms. Besides multiple stages of music, Guests can enjoy a newly renovated rooftop pool stage, impromptu pickin’ with other Jammers, activities, theme nights and the Fabulous Fremont Street Experience… Everything, an elevator ride away! « Jazzfest CUBES are here! HISB on May 3rd @ Gentilly Stage	» Line-up announced for 2018 Blue Plum Festival – HISB Included!